Faithlife newspaper publishes its last issue today, after 13 years of bi-weekly editions and more than 140 years of newspaper history in the Diocese of Erie. Despite the closing of FaithLife, readers still will get news, features and much more via the award-winning Faith magazine, sent to parishioners’ homes on a bi-monthly basis. The decision to end FaithLife was made with input from Presbyteral Council and with the blessing of Bishop Lawrence Persico. Anne-Marie Welsh, director of communications for the diocese, said the pastoral planning process underway the past few years prompted staff members to analyze the best way to evangelize through its various platforms. “As the number of Americans who receive at least some of their news from social media grows, we must divert more resources into our digital presence,” Welsh said. 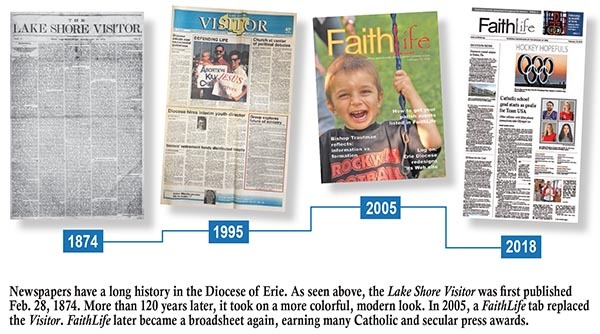 FaithLife newspaper, first published in February 2005, has its origins in the Lake Shore Visitor, the first diocesan newspaper published in 1874. Significant changes in print format occurred over those 140-plus years. With the introduction of the internet and social media, many readers have altered the way they access information. Msgr. Henry Kriegel, pastor of St. Patrick Parish, Erie, served as editor of the Lake Shore Visitor from 1976-86. He recalls the major events of 1978, when the Catholic Church had three popes: Pope Paul VI, who died Aug. 6, 1978; Pope John Paul I, who died unexpectedly on Sept. 28, 1978; and Pope John Paul II, who assumed the papacy in October 1978. “Were that to happen today, people wouldn’t go to the newspaper looking for the information. They would go to the internet. Times have changed and, thankfully, the diocese is changing in the same way,” he said.